We convert your designs into clean, cross-browser compatible, well-structured code, and then integrate it into Drupal to bring you a seamless Drupal theme in 12-24 hours. With Ink Web Solutions, PSD to Drupal gets better, quicker, and simpler than ever! Ink Web Solutions, a leading web development company from Hyderabad, specializes in PSD to Drupal conversion services. Converting PSD to Drupal themes / templates is a standard way to enhance the performance of a website. As a web development company with expertise and experience Ink Web Solutions offers PSD to Drupal theme conversion services at highly affordable costs. Cuts cost in maintenance and updation of websites. Ink Web Solutions has a team of experienced and qualified developers who are well versed with the latest developments and advancements in the CMS and web industry. 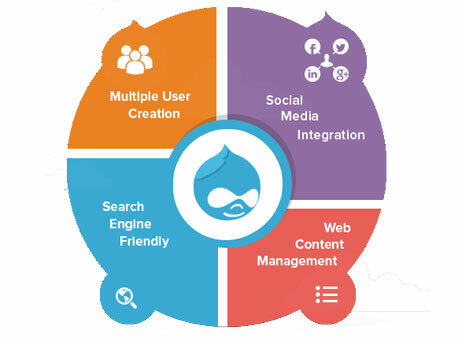 We have a dedicated team that focuses only on PSD to Drupal themes conversion. Our Drupal website designers are experienced and have the expertise to handle projects at short turnaround times. With our commitment to quality and on time delivery we convert your PSDs to Drupal templates while retaining the aesthetic appeal of your designs. Our PSD to Drupal conversion service is at the one of most affordable prices in the market. Chandigarh's Leading PSD to Drupal Conversion Company ! Ink Web Solution provides PSD to Drupal Conversion services in Chandigarh, Mohali, Himachal Pradesh and India. Apart from converting PSD designs into fully functional themes, templates and websites, we also offer PSD to Drupal integration services and HTML to Drupal conversion services. Be it theme integration or integration of websites or mobile websites, we have both experience and expertise to accomplish the job as per client requirements. We also ensure speedy delivery and that too at competitive rates.